Following intensified hostilities between Burmese government forces and ethnic armed groups in northern Shan State, the Chinese military has beefed up its manpower and munitions along the border, according to local sources. Sai Bee, a resident in Muse Township who fled across the border to the Chinese town of Shweli to escape the recent fighting, told Shan Herald that he saw tanks and more than 200 military trucks full of soldiers arriving at the China-Burma border on Saturday. 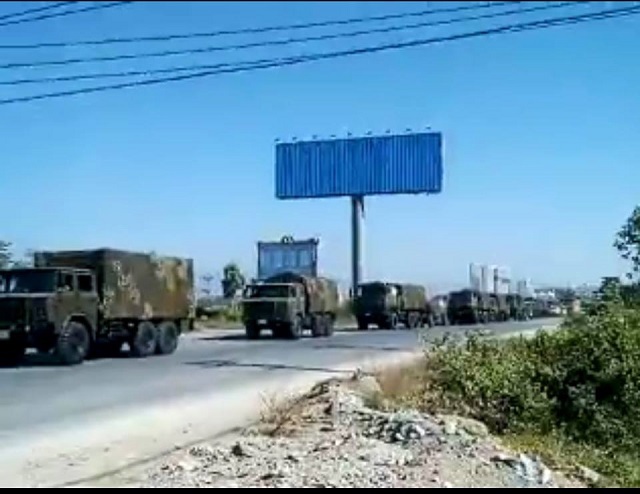 According to Ko Aung Aung who is also a resident in Muse, at least ten Burmese military trucks with troops and weapons from Lashio were on Friday heading to the volatile areas of 105-Mile, Parng Zai and Mong Koe in Muse District. Also on the Chinese border, in Namkham, some 30 kilometres southwest of Muse, security is reported to be “very tight.” Any travelers or traders going in and out the town are searched carefully, and the local bridge linking Shan and Kachin states has been closed since November 23. Last Thursday, Chinese and Burmese delegations met in Burma’s capital to discuss the ongoing conflict in northern Shan State, according to the President’s Office in Naypyidaw. Meanwhile, last Sunday, November 20, a coalition of ethnic militias – the Arakan Army (AA), Kachin Independence Army (KIA), Myanmar National Democratic Alliance Army (MNDAA) and Ta’ang National Liberation Army (TNLA) – launched a joint military operation against Burmese government outposts and police stations in the Muse Township villages of 105-Mile, Mong Koe and Parng Zai, as well as in Namkham and Kutkai townships. Fighting has left at least ten civilians dead and 30 injured, and has compelled tens of thousands, including women and children, to flee their homes.